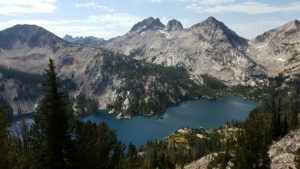 When visitors come to the Sawtooth Wilderness there is no shortage of amazing lakes that they can hike or ride to. We are frequently asked which lake is the best when it comes to do doing an all day trail ride. We have so many options to choose from, depending on the group’s riding ability and ages, but without a doubt, one of our favorite lakes to spend the day at is Alice Lake. Alice Lake is one of the Sawtooth’s most scenic lakes and has a gorgeous trail that varies in scenery the whole way up! The ride begins from the Pettit Lake trail head. 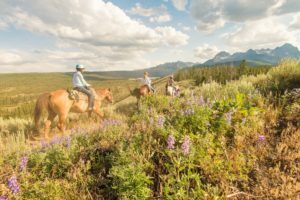 The horses follow the well-worn path through a lodgepole forest, past Pettit Lake and up to a beautiful glacial valley. The trail then climbs up the valley, through several creek crossings and opens up for spectacular views of the sheer granite walls and peaks all around you. After seven miles of this amazing country, we dismount and take a few hours to enjoy the quiet majesty of Alice Lake. We provide a hearty lunch that includes a sandwhich, chips, fruit and a homemade cookie. Of course, we always accommodate any guests with specific food allergies or preferences. Some people prefer to hike around the lake while others pack a book and sit beside the still waters to enjoy the solitude. Some people bring along their fishing pole and try their luck at fishing for spotted brook trout. For many, this beautiful yet long and rocky trail would be more than they could hike to in a day. 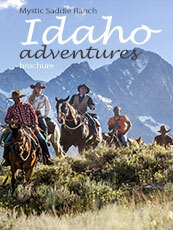 Doing a guided trail ride with us allows them to see some of the most spectacular country that Idaho has to offer. 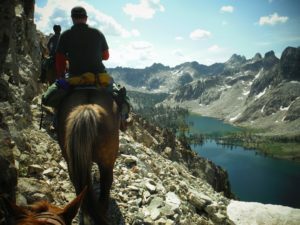 The all day trail ride to Alice Lake is truly a phenomenal Idaho Wilderness Experience. Idaho used to be one of America’s best kept secrets but lately the word seems to have gotten out! Idaho is no longer known for just potatoes . The Gem State is now making a name for itself in the outdoor recreation community. Idaho hosts some of the best rafting, fishing, trail riding, mountain biking, and hiking in the West! 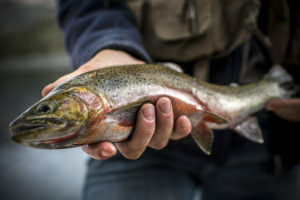 Among many of the outdoor activities that Idaho boasts, fishing for gorgeous trout is definitely at the top of the list. 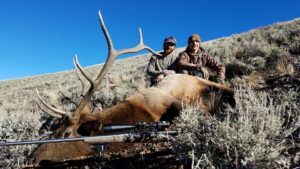 Whether you are a fly fishing enthusiast or a bait fisherman, Idaho does not disappoint in the amazing terrain you can enjoy and the fish you will catch. 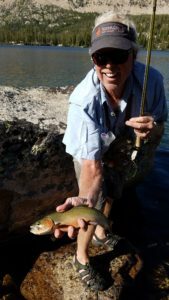 Mystic Saddle Ranch offers amazing opportunities to fish for trout in the high alpine lakes of the Sawtooth Wilderness. Our guided fishing trips are customized to each group. You will not find yourself fishing a packed lake with a bunch of strangers. We never combine groups over six people and the guides that stay in camp are knowledgeable and helpful when it comes to finding you the best fishing spot on the lake. The views cannot be beat and the absolute solitude of these wild places will leave you in awe. We handle all of the hassle and headache that comes with camping so that you can spend more time at the water. You will experience the rugged back country in style as your guides prepare dutch oven dinners, desserts, cowboy coffee and much much more! 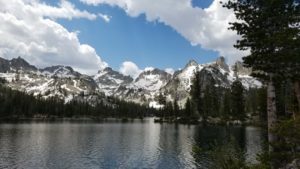 The Sawtooth Mountains are home to over 80 high alpine lakes that are stocked regularly with Brook, Rainbow, Cutthroat, Golden and Cutbow trout. When planning the perfect pack trip for a specific group, one of the first questions we always ask is “how much time do you have?”. The next question typically centers around what the group is most interested in doing while in the back country, fishing, hiking, riding, ect. For a family or group of friends that are looking to do a four day trip that encompasses all of the above, you really can’t go wrong with a pack trip to Toxaway Lake. Toxaway Lake is a large glacial lake located nine miles from the Tin Cup Trail Head. This large crystal blue body of water fills the valley and leaves spectators in awe. BUT, the view of Toxaway is not the best part! Toxaway is situated beneath two passes. The trail that cuts up and to the north leads you to the top of Sand Mountain pass. The views will absolutely take your breath away. The trail winds down the other side to Edna, Vernon and Virginia Lake. These lakes boast some of the best fishing in Sawtooth Mountains with all sorts of gorgeous trout just waiting to hit the end of your line! The trail that wraps around the inlet of Toxaway Lake and to the south takes you up to Snowy Side Pass. Snowy Side never disappoints as you gaze down at Twin Lakes and if you continue further down the trail you will find scenic Alice Lake. Day one you meet the Mystic crew at the Tin Cup Trail Head. The guides and packers will introduce themselves and begin packing up your gear and camp onto the sturdy pack horses. MSR staff spend all year looking forward to riding and guiding in this amazing country and their excitement at the start of each trip is tangible. Once you’re ready, you will saddle up and ride out with your experience guide. Midday you will crest over Farley Lake and take a break from riding to enjoy a hearty lunch while sitting above the lake and enjoying the fresh mountain air. The ride to Toxaway varies from open slopes to wooded trails to majestic rocky views. After you arrive at camp and unpack, the evening is yours to hike, fish or just relax. The guides take care of all the stock and cooking so you can simply enjoy your time at camp. Day two and three you rise from your tent that is nestled on a high alpine meadow and make your way to the kitchen area where your guides will have hot coffee, tea and coco ready. After a delicious breakfast you will pack a lunch and the saddle up for the next adventure. Toxaway’s central location is perfect for day rides over the passes to Edna and Twin Lakes. Each day ride offers phenomenal views and fishing opportunities. For those less inclined to ride, these days can be used to hike around Toxaway Lake towards the inlet waterfall or just relax with a good book lakeside. Either way, your guides will cater to your needs. The last day at camp you will have time to enjoy a large breakfast and time at Toxaway Lake before packing up and riding back home. The ride out will seem to fly by and before you know it, you will be back in civilization. The jagged mountain tops and clear water will stay with you as you head home and you may find, like we do, that you spend the rest of the year dreaming about when you can get back into the Sawtooth Mountains again. 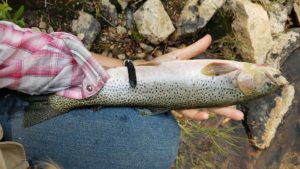 For a first hand account of a trip to Toxaway Lake and more pictures, please read a blog posted by one of our guests, HERE!. Sun Valley, Idaho is one of the best places for families to spend their summer vacation! Located near Wilderness and National Forests but also hosting resorts and spas, Sun Valley offers the perfect variety of activities for any family! 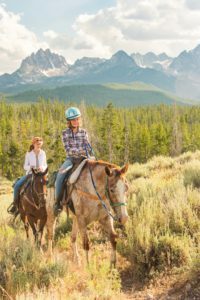 When vacationing in Sun Valley, families have endless options of activities and sights to see but a trail ride at Redfish Corral is definitely at the top of the list! Redfish Corral is located just 60 minutes north of Sun Valley, Idaho, and offers a unique trail riding experience in some of the most beautiful wilderness that Idaho has to offer. 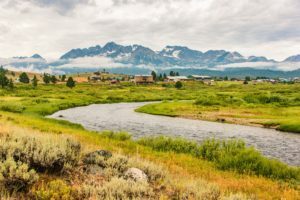 The drive from the Sun Valley and Ketchum area to Redfish Corral is along the scenic byway and offers gorgeous glimpses of the mountains, rivers and forests. Once you cross over Galena Summit the view opens up to the spectacular Sawtooth Mountains and you will be blown away by the rugged beauty. The highway drops down into the Sawtooth Valley and meanders by the Salmon River all the way up to your turn off for Redfish Lake. When you arrive at Redfish Corral, you will be greeted by the professional and friendly staff. Redfish Corral guides are always kind and courteous and put the safety and happiness of their guests first. They will be sure to equip your kiddos (6-12 years old) with a certified equestrian helmet and demonstrate to every rider the riding basics before helping you saddle up. The knowledgeable staff does their best to fit you and your family with the perfect horse that will be your trail companion for the length of the ride. 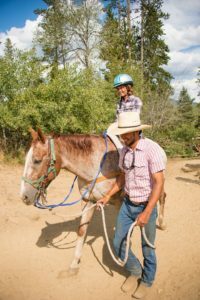 The guides are very familiar with kids and beginner riders so they do a exceptional job of helping put your nerves at ease while also explaining what you need to know about trail riding. If you have a children that are five years old or younger, Redfish Corral won’t leave you hanging! The staff will happily help the little ones saddle up for a short pony ride around the corral. These complimentary pony rides on the gentle trail horses are a great introduction to riding and are also a great photo opportunity! 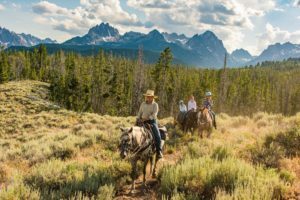 After your trail ride, you will want to continue down the road to Redfish Lake where you can take the family swimming, fishing, shopping, bike riding and even grab a bite to eat! 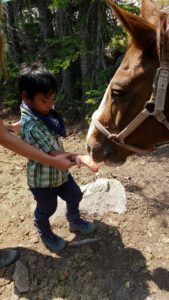 When planning your family vacation to Sun Valley, Idaho, don’t miss out on the family friendly trail rides at Redfish Corral! This top kid-friendly activity may easily become the highlight of your trip. Mystic Saddle Ranch is a well-known name in Idaho and has been since 1969. Known for our excellent customer service and exceptional standards, Mystic Saddle Ranch is a company people trust. Redfish Corrals also has a extraordinary reputation in the Stanley area. Hardly any family comes to Stanley, Idaho without making a visit out to Redfish Lake. Redfish Lake Lodge supplies endless activities for visitors of all ages. You can rent kayaks, paddle boards, pontoon boats and the list goes on and on. There is often live music playing in the evenings and you can sit out on the beach or in the grass and listen as you enjoy a snack from the gift shop or dinner from the gazebo. Hiking and biking trails attract the active crowd while the stylish Limbert’s restaurant provides dining for the elegant. 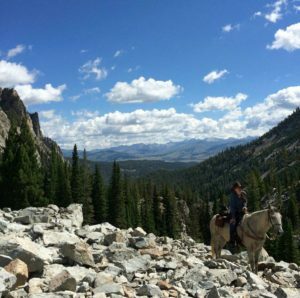 A trip to Redfish Lake just isn’t complete without a guided trail ride at Redfish Corral. Redfish Corral is located just before the lodge and offers a variety of options, from pony rides for little kids under six years old to full day trips. The guides at Redfish Corral are friendly and knowledgeable and always put the safety of their guests’ first. They know the landscape well and happily share their information of the geology, flora, fauna and history. The horses at the corral are surefooted and gentle. These working animals are well groomed and fed as evident by their big bellies and shining coats. Nervous riders find their footing at Redfish Corral as the guides and horses take great care to maneuver through spectacular terrain. You will often catch a glimpse of Idaho’s wildlife from the trail as your steady mountain horse pick its away through the meadows and trees. Eagles may fly overhead as you pass by Little Redfish Lake and mother mule deer will peek at you with their small fawns watching nearby. The views from the trail ride will leave you speechless and wanting more. The majestic Sawtooth Mountains lay before you as you ride past lodgepole pine forests and delicate mountain flowers. 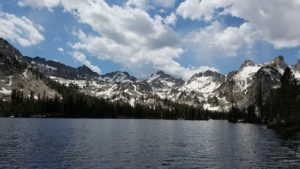 If you plan on being in the Stanley or Sun Valley area, don’t miss out on a day trip to Redfish Lake! Enjoy the scenery, the lodge and the horses! We hope to see you soon! Now Booking Trips for the 2018 Season! Now that everyone has had a chance to breathe after the holidays and really settle into the new year, families are starting to think about the upcoming summer and how to best spend their hard-earned vacation days. 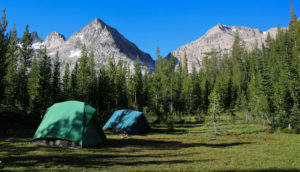 Many parents dream of taking their kids on a camping trip that they will remember forever but shudder at the thought of all of the expenses and hassle that can go along with that. Many folks want to see new places that they’ve never been and try something new but have no idea how to accomplish such a goal and enjoy the experience in the process. Mystic Saddle Ranch (MSR) has the perfect solution for any family that is looking to spend time outdoors. 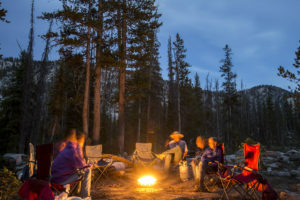 Whether a family is new to camping or just new to outfitted camping, MSR can customize the perfect trip. MSR takes care of all the prep and anxiety that goes into planning the perfect family vacation. Call the friendly owners of Mystic Saddle Ranch at 207-774-3591. Discuss the best dates for your group and how many days you would like to spend in the beautiful Sawtooth Mountains. Pick what activities fit your family best. Are you looking to ride, hike, fish or lounge around the lake? Decided if you want a fully catered trip that includes all the camping amenities; guides, horses and tack or if you would prefer to be dropped off at the best lake for your group and picked back up at the end of your stay. When booking a trip with Mystic Saddle Ranch, you will work directly with the owners who can easily direct you to the best location for your trip. The owners can recommend the best lakes for fishing, the perfect destination for nervous riders or the best length for campers who want to access the heart of the wild country. They are willing and ready to answer all your questions. 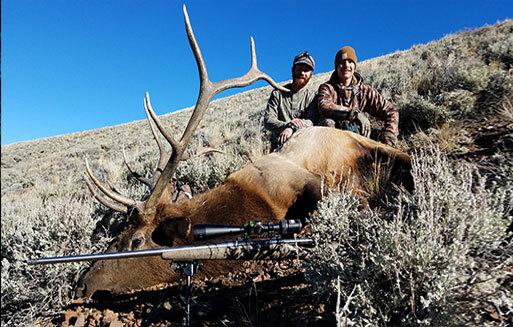 When you book a trip of four or more people with MSR you will be in the back country with only your family, they will never bundle groups into one camp site to increase the bottom line. Each trip is customized and tailored to fit that particular group. The 2018 calendar is now open for reservations. Don’t hesitate to talk to the professionals at Mystic Saddle Ranch! Be sure to check out tripadvisor.com reviews to hear what other groups had to say about their experience with MSR.